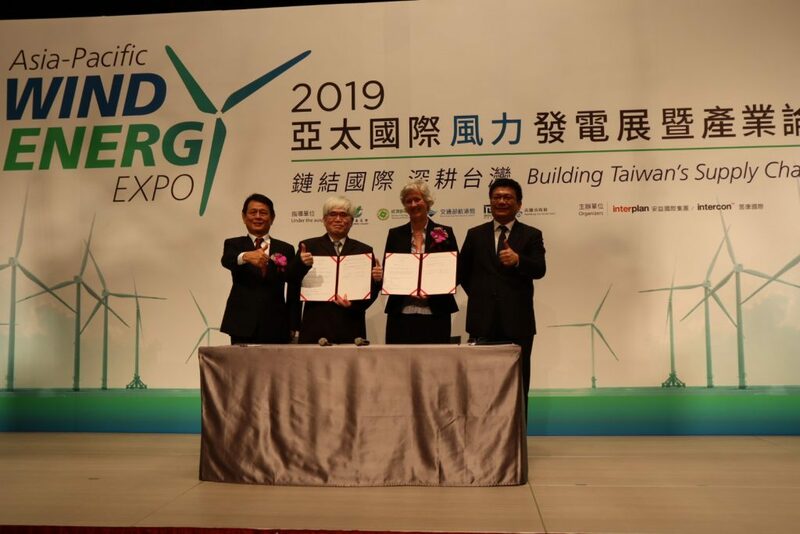 During 2019 Asia-Pacific Wind Energy Expo, Taiwan International Ports Corp. (TIPC) signed a memorandum of understanding for cooperation with the British Office Taipei for the development of wind power. Chung Ying-feng, general manager of Port of Taichung Taiwan International Ports Corp., a branch of TIPC, remarked that in planning its development, a port must follow the trend of international trade and green energy/environmental protection. The cooperation will enable TIPC to take advantage of British experience in offshore wind power in pushing the development of green ports, according to Chung. Catherine Nettleton, Representative of the British Office Taipei, hoped that the U.K. can help Taiwanese ports catch up with the offshore wind power current via the cooperation. The signing of the MOU coincides with the release of the "U.K. Offshore Wind Sector Deal" by the British government, which calls for the establishment of a low-cost clean energy system in the U.K. and intensified cultivation of British wind-power talent. The U.K. is now the global champion of offshore wind power, in terms of power output. Since the inauguration of its first offshore wind field in 2003, the U.K. has installed offshore wind turbines with total capacities reaching 7.6 GW, which is expected to hit 10 GW by 2020. The rapid development has engaged topnotch developers from around the world and fostered a complete supply chain, including port construction, submarine cables, maintenance, and consulting/planning. In recent years, British offshore wind-power firms have begun exporting their expertise to countries worldwide. Chung Ying-feng reported that under the guidance of the Ministry of Transportation and Communications, TIPC has been actively taking part in the planning and deployment of offshore wind power. A dedicated dock for offshore-wind power equipment at Taichung Harbor was completed at the end of 2018, which will accommodate advance assembly of wind-turbine blades starting late March. Taichung Harbor has also put aside dock No. 43 and adjacent area for advance assembly of submarine foundations. It will serve as the base for the operation of offshore wind power working crafts. The harbor will develop in the direction of an all-round offshore wind power port, providing infrastructure, logistics services, wind turbine maintenance and repair, and wind power talent training.